Piping can be recycled and actually make great DIY Projects. With the many different alternative uses of piping the options are endless. This article will discuss with one of the most common alternative uses of piping — gardening. And even with gardening, there are many different ways to go about using pipes for your home garden. In our previous article, we discussed how piping could be used to create your own greenhouse. 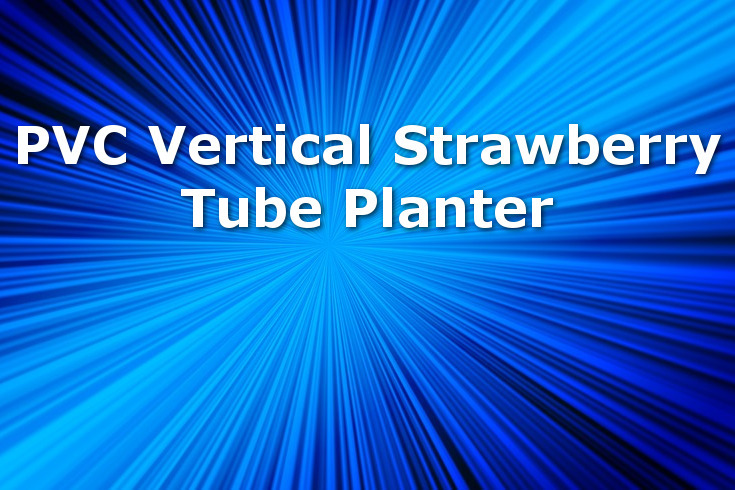 This article will discuss how piping can be recycled to make your own vertical strawberry tube planter. Choose a length of unit and cut the tower tube and watering tube accordingly. It is crucial not to forget to make the watering tube 8-10cm longer. The next step is to drill vent holes in the watering tube. These should only be drilled in the top 2/3 of the tube as the water will run down the bottom plants. If you drill holes all the way down the upper planter won’t get quite enough water as it will all rush out the lower holes. If you believe you will do a good job capping off the base end of the tube, you can put one small hole at the bottom so it doesn’t go anaerobic inside the tube. Once you’ve drilled the vent holes in the watering tube, cut the geotextile or hessian to the shape that will cover the holes in the watering pipe. You don’t want the roots getting in there and clogging it up. Then, using a knife, carefully whittle down the cork until it fits the end of the watering tube. Once you’ve done this, seal it off with duct tape. Next, cut the holes in the tower tube. It is important to remember that one side will face the wall, so only put holes on the surfaces that will get sunlight. Now, you can place the larger container against the wall — a corner is best so the tube is less likely to fall over. Place the end cap over the base of the tube and insert the watering tube, then fill the bottom 10 cm with coarse gravel. For the lowest hole, consider planting a companion, so there is less incentive for pests to climb up. If you are using stoloniferous varieties you can leave a few gaps in the lower holes. When the runners cascade down you can poke them into these vacant spaces. Once you’ve planted it, make sure when moving it that you hold it with one hand under the end cap if it’s not fixed. Secure it with your chosen fixings. When it comes to watering your plants, you will need to do this daily in warmer weather. Vertical units do require vigilant watering. The last thing you want is for it to dry out. Another helpful tip is that if you are noticing ants farming aphids on your strawberries, locate their path and smear some orange/citrus oil around the unit at this point. This will get rid of the ants without harming your plants. Click here for the full tutorial with pictures.